The word journey can be widely interpreted to have a multitude of meanings for a wide range of people, but for my piece I’m going to choose Rob Reiner’s visualisation of Stephen King’s classic: The Body. The story of four young boys who set out to find a dead body, but on the way end up finding themselves. 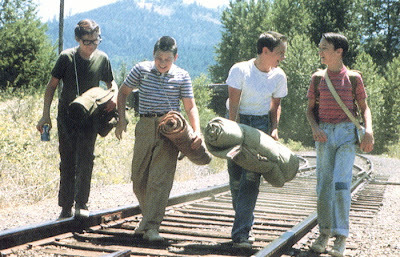 Stand by Me, as a film, it tries to encompass the idea of growing up in the space of 3 days. It challenges the social stereotypes forced onto the boys, shows the pain that can come from the loss of a relative, and the imagination and acceptance that all children have. A journey is as much about the people you meet, and travel with, as the journey itself which is what this film displays perfectly, the change in the four boys from start to finish shows that it was not a journey to find a dead body but a journey to discover more about themselves. The range of emotions shown in the film throughout their journey, and the conclusions it comes to, vary as widely as they do throughout our experiences of growing up. The above image shows the four as they are at the beginning of their journey, full of hope and excitement, and just being content with the adventure they are experiencing. From that we come to one of the most emotional scenes in movie history, this scene shows the pain and suffering that comes from the loss of Gordie’s Brother, even from this still you can see the obvious strength of Chris and the empathy he has for his best friend. The journey of life is portrayed at the end and very beginning of the film with the death of Chris weighing heavily on Gordie’s mind, The last stage of the journey being the slow separation of two best friends, something I think a lot of people have experienced. While Vern and Teddy are also part of the four, they are most definitely the two less important characters. While they come along for the journey their change is different, Vern takes the same sort of role as the Cowardly Lion in the Wizard of Oz, he goes from an opaque, boring scaredy-cat to someone who has some more guts. Teddy who is closest to Vern in the four, notices this change in Vern by the end of the film, they almost have a small role reversal, as the dominant and subjective friend. The ‘two for flinching’ punches that go on throughout the film display the slow change in dominance, and the resistance we see from Teddy, leading to the eventual fist fist between the two. This journey is less important than the journey of Chris and Gordie, a more childish, less entertaining journey. ← Funniest comedians of the decade.